B J Folz, A Ferlito, N Weir, L W Pratt, A Rinaldo, J A Werner,	The Journal of Laryngology & Otology, Volume 121 Issue 6, pp 511-520. Y Ramakrishnan, A Kotecha, D A Bowdler,	The Journal of Laryngology & Otology, Volume 121 Issue 6, pp 521-525. Rhinitis due to food allergies: fact or fiction? V Malik, S Ghosh, T J Woolford,	The Journal of Laryngology & Otology, Volume 121 Issue 6, pp 526-529. D Marchioni, M Alicandri Ciufelli, L Presutti,	The Journal of Laryngology & Otology, Volume 121 Issue 8, pp 707-712. E McNeill, Y Ramakrishnan, S Carrie,	The Journal of Laryngology & Otology, Volume 121 Issue 8, pp 713-720. D J McFerran, D M Baguley,	The Journal of Laryngology & Otology, Volume 121 Issue 4, pp 301-305. R J Sim, R P Youngs,	The Journal of Laryngology & Otology, Volume 121 Issue 4, pp 306-311. S Lo, J Rowe-Jones,	The Journal of Laryngology & Otology, Volume 121 Issue 8, p .
A Tjellström, G Granström, M Odersjö,	The Journal of Laryngology & Otology, Volume 121 Issue 2, pp 101-104. M Z Uğuz, S Arslanoğlu, S Terzi, D Etit,	The Journal of Laryngology & Otology, Volume 121 Issue 4, p .
D J McFerran, J S Phillips,	The Journal of Laryngology & Otology, Volume 121 Issue 3, pp 201-208. P Jayanth Kumar, G J C Smelt,	The Journal of Laryngology & Otology, Volume 121 Issue 1, pp 1-4. A J Roper, A Farragher, J J Homer, M Helbert,	The Journal of Laryngology & Otology, Volume 121 Issue 8, p .
B Vaishali, A Nambiar, R Indudharan,	The Journal of Laryngology & Otology, Volume 121 Issue 4, p .
C C Chan, D E Saunders, W K Chong, B E Hartley, E Raglan, K Rajput,	The Journal of Laryngology & Otology, Volume 121 Issue 2, pp 105-109. M Szymański, K Morshed, R Mills,	The Journal of Laryngology & Otology, Volume 121 Issue 1, pp 5-8. P J Robb,	The Journal of Laryngology & Otology, Volume 121 Issue 3, pp 209-214. M Kraus, I Shelef, A Niv, D M Kaplan,	The Journal of Laryngology & Otology, Volume 121 Issue 8, p .
N Ahmad, C Etheridge, M Farrington, D M Baguley,	The Journal of Laryngology & Otology, Volume 121 Issue 2, pp 110-113. M-I Kos, C Degive, C Boex, J-P Guyot,	The Journal of Laryngology & Otology, Volume 121 Issue 3, pp 215-218. Y Nazarian, B Shalmon, Z Horowitz, L Bedrin, M R Pfeffer, Y P Talmi,	The Journal of Laryngology & Otology, Volume 121 Issue 4, p .
S Basu, C Georgalas, P Sen, A K Bhattacharyya,	The Journal of Laryngology & Otology, Volume 121 Issue 1, pp 9-14. A Kiris, T Karlidag, E Kocakoc, Z Bozgeyik, M Sarsilmaz,	The Journal of Laryngology & Otology, Volume 121 Issue 1, pp 15-18. M A Siddiq, L M Hanu-Cernat, R M Irving,	The Journal of Laryngology & Otology, Volume 121 Issue 2, pp 114-117. H Yasan,	The Journal of Laryngology & Otology, Volume 121 Issue 3, pp 219-221. N Purohit, R Pratap, O P Chawla,	The Journal of Laryngology & Otology, Volume 121 Issue 4, p .
H Kishore C Prasad, S Sreedharan, H Sampath C Prasad, M Hari Meyyappan, K Shri Harsha,	The Journal of Laryngology & Otology, Volume 121 Issue 6, pp 530-534. L Jovanovic-Bateman, G Warrington,	The Journal of Laryngology & Otology, Volume 121 Issue 6, pp 535-538. J M Bernstein, N J Holland, G C Porter, A R Maw,	The Journal of Laryngology & Otology, Volume 121 Issue 2, pp 118-123. F C Van Wyk, S Massey, G Worley, S Brady,	The Journal of Laryngology & Otology, Volume 121 Issue 3, pp 222-227. M Z Naja, M El-Rajab, W Kabalan, M T Itani, K Kharma, M A Al Tannir, M F Ziade,	The Journal of Laryngology & Otology, Volume 121 Issue 1, pp 19-24. D D Pothier, C E J Hall, S Gillett, P Nankivell,	The Journal of Laryngology & Otology, Volume 121 Issue 3, pp 228-230. G Worley, Y Bajaj, L Cavalli, B Hartley,	The Journal of Laryngology & Otology, Volume 121 Issue 1, pp 25-27. J F Thong, S Lo, R Houghton, V Moore-Gillon,	The Journal of Laryngology & Otology, Volume 121 Issue 2, pp 124-129. D-Y Xu, Y-D Tang, S-X Liu, J Liu,	The Journal of Laryngology & Otology, Volume 121 Issue 8, pp 721-724. M A Siddiq, V V Raut,	The Journal of Laryngology & Otology, Volume 121 Issue 6, pp 539-544. I Courtmans, V Mancilla, C Ligny, P Hilbert, A L Mansbach, L Van Maldergem,	The Journal of Laryngology & Otology, Volume 121 Issue 4, pp 312-317. M S Timms, I A Bruce, N K Patel,	The Journal of Laryngology & Otology, Volume 121 Issue 1, pp 28-30. 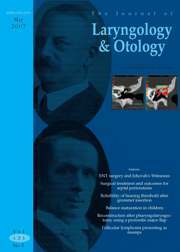 Y Erbil, A Bozbora, B Tulumoğlu Yanık, N Özbey, A Salmaslıoğlu, S Özarmağan,	The Journal of Laryngology & Otology, Volume 121 Issue 3, pp 231-236. E I Drivas, J K Hajiioannou, V A Lachanas, A J Bizaki, D E Kyrmizakis, J G Bizakis,	The Journal of Laryngology & Otology, Volume 121 Issue 2, pp 130-133. L R Lustig, J Sciubba, M J Holliday,	The Journal of Laryngology & Otology, Volume 121 Issue 8, pp 725-735. A Robinson, T Beech, A L McDermott, A Sinha,	The Journal of Laryngology & Otology, Volume 121 Issue 6, pp 545-547. J T F Postelmans, B Cleffken, R J Stokroos,	The Journal of Laryngology & Otology, Volume 121 Issue 4, pp 318-323. R I S Winterton, A Alaani, D Loke, C Bem,	The Journal of Laryngology & Otology, Volume 121 Issue 2, pp 134-137. G Magliulo, A Stasolla, D Parrotto, M Marini,	The Journal of Laryngology & Otology, Volume 121 Issue 8, pp 736-741. F Buck, M Drinnan, J Wilson, I S Barnard,	The Journal of Laryngology & Otology, Volume 121 Issue 1, pp 31-39. C Page, V Strunski,	The Journal of Laryngology & Otology, Volume 121 Issue 3, pp 237-241. D Holzmann, I Hegyi, G P Rajan, M Harder-Ruckstuhl,	The Journal of Laryngology & Otology, Volume 121 Issue 6, pp 548-554. Peter K M Ku, Michael C F Tong, Andrew van Hasselt,	The Journal of Laryngology & Otology, Volume 121 Issue 2, pp 138-142. E De Corso, M R Marchese, B Sergi, M Rigante, G Paludetti,	The Journal of Laryngology & Otology, Volume 121 Issue 4, pp 324-328. F Syeda, F Ahsan, D A Nunez,	The Journal of Laryngology & Otology, Volume 121 Issue 6, pp 555-558. P Burns, C Timon,	The Journal of Laryngology & Otology, Volume 121 Issue 3, pp 242-245. K Padmanabhan, B Vaishali, R Indudharan,	The Journal of Laryngology & Otology, Volume 121 Issue 8, pp 742-744. C Y Eng, A S Evans, M S Quraishi, P A Harkness,	The Journal of Laryngology & Otology, Volume 121 Issue 1, pp 40-43. K S Orhan, T Demirel, B Baslo, E K Orhan, E A Yücel, Y Güldiken, K Değer,	The Journal of Laryngology & Otology, Volume 121 Issue 1, pp 44-48. V Nakhla, Y M Takwoingi, A Sinha,	The Journal of Laryngology & Otology, Volume 121 Issue 4, pp 329-332. ‘Group and save’ for paediatric tonsillectomy: is it required routinely? M-L Montague, M S W Lee, S S M Hussain,	The Journal of Laryngology & Otology, Volume 121 Issue 6, pp 559-562. M I J Khan, N Mukhtar, S R Saeed, R T Ramsden,	The Journal of Laryngology & Otology, Volume 121 Issue 8, pp 745-750. P Bonfils, J Trotoux, V Bassot,	The Journal of Laryngology & Otology, Volume 121 Issue 2, pp 143-148. A Jebreel, D Mistry, D Loke, G Dunn, V Hough, K Oliver, N Stafford, J Greenman,	The Journal of Laryngology & Otology, Volume 121 Issue 3, pp 246-252. B K Mohanti, P Nachiappan, R M Pandey, A Sharma, S Bahadur, A Thakar,	The Journal of Laryngology & Otology, Volume 121 Issue 1, pp 49-56. Are maxillary mucosal cysts a manifestation of inflammatory sinus disease? R P S Harar, N K Chadha, G Rogers,	The Journal of Laryngology & Otology, Volume 121 Issue 8, pp 751-754. Topical antibiotic ototoxicity: does it influence our practice? E C Ho, A Alaani, R Irving,	The Journal of Laryngology & Otology, Volume 121 Issue 4, pp 333-337. Should FDG-PET scanning be routinely used for patients with an unknown head and neck squamous primary? P Silva, P Hulse, A J Sykes, B Carrington, P J Julyan, J J Homer, D L Hastings, N J Slevin,	The Journal of Laryngology & Otology, Volume 121 Issue 2, pp 149-153. O A Albirmawy,	The Journal of Laryngology & Otology, Volume 121 Issue 3, pp 253-257. E Tsiambas, I Stavrakis, A C Lazaris, A Karameris, E Patsouris,	The Journal of Laryngology & Otology, Volume 121 Issue 6, pp 563-570. Are the demographics for squamous cell cancer in the head and neck changing in the United Kingdom? M A Hassan, V J Lund, D J Howard, A A Sacker,	The Journal of Laryngology & Otology, Volume 121 Issue 2, pp 154-157. Z Awad, D D Pothier,	The Journal of Laryngology & Otology, Volume 121 Issue 1, pp 57-60. S Sood, A Waddell,	The Journal of Laryngology & Otology, Volume 121 Issue 4, pp 338-340. A M Robinson, J A Gaskin, C M Philpott, P C Goodenough, M Elloy, A Clark, G E Murty,	The Journal of Laryngology & Otology, Volume 121 Issue 8, pp 755-758. A D Cohen, D M Kaplan, M Kraus, E Rubinshtein, D A Vardy,	The Journal of Laryngology & Otology, Volume 121 Issue 3, pp 258-261. D C Howlett, B Harper, M Quante, A Berresford, M Morley, J Grant, K Ramesar, S Barnes,	The Journal of Laryngology & Otology, Volume 121 Issue 6, pp 571-579. W A Abdel Hamid, L M Flood, F W Martin,	The Journal of Laryngology & Otology, Volume 121 Issue 3, pp 262-265. J Galli, F Ardito, L Calò, L Mancinelli, M Imperiali, C Parrilla, P M Picciotti, G Fadda,	The Journal of Laryngology & Otology, Volume 121 Issue 4, pp 341-344. P J Clamp, S Gunasekaran, D D Pothier, M W Saunders,	The Journal of Laryngology & Otology, Volume 121 Issue 6, pp 580-583. M Abdelkader, S C Leong, P S White,	The Journal of Laryngology & Otology, Volume 121 Issue 8, pp 759-762. P Homøe, J Rosborg,	The Journal of Laryngology & Otology, Volume 121 Issue 1, pp 65-67. N J Clifton, N S Jones,	The Journal of Laryngology & Otology, Volume 121 Issue 4, pp 345-348. A L Webb, P N Carding, I J Deary, K MacKenzie, I N Steen, J A Wilson,	The Journal of Laryngology & Otology, Volume 121 Issue 8, pp 763-767. Can we improve dysphagia referrals? S A Phillips, P D Ross, K Chalmers, G MacDougall,	The Journal of Laryngology & Otology, Volume 121 Issue 6, pp 584-587. D R Nayak, K Pujary, M Aggarwal, S E Punnoose, V A Chaly,	The Journal of Laryngology & Otology, Volume 121 Issue 4, pp 349-353. H Nakagawa, M Nagasao, T Kusuyama, H Fukuda, K Ogawa,	The Journal of Laryngology & Otology, Volume 121 Issue 2, pp 163-165. E Abelardo, M Jaramillo, E Sheffield, P Tierney,	The Journal of Laryngology & Otology, Volume 121 Issue 3, pp 268-270. N Nerurkar, N Narkar, A Joshi, K Kalel, R Bradoo,	The Journal of Laryngology & Otology, Volume 121 Issue 8, pp 768-771. A Liapi, P J Robb, A Akthar,	The Journal of Laryngology & Otology, Volume 121 Issue 6, pp 588-591. T Ito, T Tsutsumi, K Ohno, T Takizawa, K Kitamura,	The Journal of Laryngology & Otology, Volume 121 Issue 1, pp 68-71. S Maitra, C G L Hobbs, K L Evans,	The Journal of Laryngology & Otology, Volume 121 Issue 3, pp 271-273. N Shoman, N Longridge,	The Journal of Laryngology & Otology, Volume 121 Issue 2, pp 166-169. A Gungor, H Cincik, H Baloglu, E Cekin, S Dogru, E Dursun,	The Journal of Laryngology & Otology, Volume 121 Issue 8, pp 772-774. A N Acharya, S Mirza, N S Jones,	The Journal of Laryngology & Otology, Volume 121 Issue 4, pp 354-357. D Bray, A Michael, D T Falconer, H S Kaddour,	The Journal of Laryngology & Otology, Volume 121 Issue 1, pp 72-75. T Mackle, J Meaney, C Timon,	The Journal of Laryngology & Otology, Volume 121 Issue 4, pp 358-361. L K Springborg, J B Springborg, J Thomsen,	The Journal of Laryngology & Otology, Volume 121 Issue 1, pp 76-79. D R Nayak, K Pujary, M Valiathan, P Parul, A Kamat,	The Journal of Laryngology & Otology, Volume 121 Issue 3, pp 274-276. T Sasaki, K Yamamoto, T Akashi,	The Journal of Laryngology & Otology, Volume 121 Issue 2, pp 170-173. S-T Toh, H-W Yuen, Y-H Goh,	The Journal of Laryngology & Otology, Volume 121 Issue 8, pp 775-778. P D Karkos, S C Leong, A K Arya, S M Papouliakos, M T Apostolidou, W J Issing,	The Journal of Laryngology & Otology, Volume 121 Issue 8, pp 779-782. R Kanayama, K Oka, M Fukunaga, H Tomisawa, Y Takahashi, M Okano, H Hakozaki,	The Journal of Laryngology & Otology, Volume 121 Issue 6, pp 597-600. M Iseri, E Ustundag, Ö Aydın,	The Journal of Laryngology & Otology, Volume 121 Issue 3, pp 277-278. D Rajenderkumar, K L Farrell, R M Alles, L Savy,	The Journal of Laryngology & Otology, Volume 121 Issue 1, pp 80-82. K Menon, C Bem, D Gouldesbrough, D R Strachan,	The Journal of Laryngology & Otology, Volume 121 Issue 4, pp 362-368. D M Hartl, S Leboulleux, P Klap, M Schlumberger,	The Journal of Laryngology & Otology, Volume 121 Issue 2, pp 174-178. J W Rainsbury, O J H Whiteside, I D Bottrill,	The Journal of Laryngology & Otology, Volume 121 Issue 6, pp 601-605. D P Crampsey, C M Douglas, L D Cooke,	The Journal of Laryngology & Otology, Volume 121 Issue 3, pp 279-280. M H Abd El-Monem, Emad A Magdy,	The Journal of Laryngology & Otology, Volume 121 Issue 4, pp 369-377. O F Adunka, C A Buchman,	The Journal of Laryngology & Otology, Volume 121 Issue 1, pp 83-86. R M Newbegin, J C Rhodes, L M Flood, H C Richardson,	The Journal of Laryngology & Otology, Volume 121 Issue 8, pp 783-785. M M Abo-Khatwa, S Abouel-Enin, O Klimach, J Osborne,	The Journal of Laryngology & Otology, Volume 121 Issue 2, pp 179-181. K Wu, E Walker, G Owen,	The Journal of Laryngology & Otology, Volume 121 Issue 4, pp 378-381. M Nakayama, H Hirose, M Okamoto, S Miyamoto, S Yokobori, M Takeda, Y Seino, E Kawashima,	The Journal of Laryngology & Otology, Volume 121 Issue 1, pp 87-91. J Benton, A Karkanevatos,	The Journal of Laryngology & Otology, Volume 121 Issue 6, pp 606-608. A Harimaya, H Tsubota, K Hoki, J Sato, A Kondo, T Yamada, N Seki, H Ikeda, T Himi,	The Journal of Laryngology & Otology, Volume 121 Issue 3, pp 281-284. M R Markiewicz, J E Margarone 3rd, J L Tapia, A Aguirre,	The Journal of Laryngology & Otology, Volume 121 Issue 2, pp 182-185. G Ramaswami, P K Jain, V R Talati,	The Journal of Laryngology & Otology, Volume 121 Issue 1, pp 92-93. P S Hans, A Belloso, P Z Sheehan,	The Journal of Laryngology & Otology, Volume 121 Issue 4, pp 382-386. E Dursun, S Dogru, H Cincik, E Cekin, A Gungor, E Poyrazoglu,	The Journal of Laryngology & Otology, Volume 121 Issue 6, pp 609-610. S Shukla, S M Keh, P Andrews, H Saleh,	The Journal of Laryngology & Otology, Volume 121 Issue 2, pp 186-188. F Esteban, J M González-Pérez, J P Benaixa, M Redondo, M Nevado, J López-Garrido, A Piñero,	The Journal of Laryngology & Otology, Volume 121 Issue 3, pp 285-288. S Thomas, A Daudia, N S Jones,	The Journal of Laryngology & Otology, Volume 121 Issue 8, pp 794-795. O A Adelola, R Fernandez, R Ahmad, M Leamy, B G Moriarty,	The Journal of Laryngology & Otology, Volume 121 Issue 3, pp 289-292. S Mahendran, V S Sunkaraneni, D M Baguley, P R Axon,	The Journal of Laryngology & Otology, Volume 121 Issue 2, pp 189-191. G Kuruvilla, A Job, M Thomas,	The Journal of Laryngology & Otology, Volume 121 Issue 1, pp 94-95. E Phelan, E Lang, B N Mahesh, J Lang,	The Journal of Laryngology & Otology, Volume 121 Issue 3, pp 293-295. N Sharma, M De, P Pracy,	The Journal of Laryngology & Otology, Volume 121 Issue 6, pp 1-2. N Munir, N S Jones,	The Journal of Laryngology & Otology, Volume 121 Issue 2, pp 192-195. E Hopsu, A Pitkäranta,	The Journal of Laryngology & Otology, Volume 121 Issue 8, pp 796-799. F O Agada, A P Coatesworth, A R H Grace,	The Journal of Laryngology & Otology, Volume 121 Issue 4, pp 390-392. J Doshi, S Anari, I Zammit-Maempel, V Paleri,	The Journal of Laryngology & Otology, Volume 121 Issue 8, pp 800-802. S Brewis, D M Baguley,	The Journal of Laryngology & Otology, Volume 121 Issue 4, pp 393-394. G Psillas, G Kyriafinis, J Daniilidis,	The Journal of Laryngology & Otology, Volume 121 Issue 2, pp 196-199. M Unal, C Bagdatoglu,	The Journal of Laryngology & Otology, Volume 121 Issue 3, pp 296-298. B Mukherjee, T Shivakumar,	The Journal of Laryngology & Otology, Volume 121 Issue 4, pp 395-397. S G Khoo, I Ullah, F Wallis, J E Fenton,	The Journal of Laryngology & Otology, Volume 121 Issue 8, pp 803-805. S Ali, A Kishore,	The Journal of Laryngology & Otology, Volume 121 Issue 4, pp 398-400. F Jégoux, B Godey, L Riffaud, X Morandi,	The Journal of Laryngology & Otology, Volume 121 Issue 4, pp 401-403. A Naraghi, M Keene,	The Journal of Laryngology & Otology, Volume 121 Issue 4, pp 404-407. Y Bajaj, A Rokade, P R De,	The Journal of Laryngology & Otology, Volume 121 Issue 1, pp 61-64. R J Harvey, P Fagan, M Baldwin,	The Journal of Laryngology & Otology, Volume 121 Issue 2, pp 158-159. M Caversaccio, J Garcia-Giraldez, M Gonzalez-Ballester, G Marti,	The Journal of Laryngology & Otology, Volume 121 Issue 2, pp 160-162. M Lim, S Lew-Gor, G Sandhu, D Howard, V J Lund,	The Journal of Laryngology & Otology, Volume 121 Issue 6, pp 592-594. E C Ho, S Jajeh, N Molony,	The Journal of Laryngology & Otology, Volume 121 Issue 6, pp 595-596. S Gane, C East, S Jayaraj, P Andrews,	The Journal of Laryngology & Otology, Volume 121 Issue 4, pp 387-389. V J Possamai, H Griffiths,	The Journal of Laryngology & Otology, Volume 121 Issue 3, p 299.